05/01/14 - Syndicated food columnist Linda Gassenheimer, Special wine correspondent Fred Tasker and Bonnie Berman interview Chef Richard Ingraham, personal chef to Dwyane Wade. He talks about what he makes for the Heat star to keep in shape especially for these championship games and we taste Wade’s favorite dish on air. Salmon steaks are thick and juicy and a nice alternative to salmon fillets. The lemon dill sauce takes only minutes to mix together. Gentle poaching is a fail-safe method of cooking salmon. It remains moist, juicy and flavorful. The secret to poaching salmon is to slightly undercook it. It will continue to cook in its own heat for a few minutes after it is removed from the poaching liquid. Wild salmon is in season now. It’s a wonderful treat. Buy extra and freeze it for when it is out of season. To test for doneness, insert a knife into the meat and pull the flesh away slightly. It should be opaque, not clear. Arugula adds zing to salads. My Italian friends also like it cooked in pasta as it is in this side dish. Any type of pasta can be used. Cook according to package instructions. Salmon fillets can be used instead of salmon steaks. The quickest way to use fresh dill is to snip it with a scissors. Freeze-dried dill can be used instead. Minced garlic can be found in the produce section of the supermarket. Place salmon on to poach. Place water and clam juice in a large saucepan and bring to a simmer. Slip salmon into liquid and let simmer, gently, do not boil, for 5 minutes. 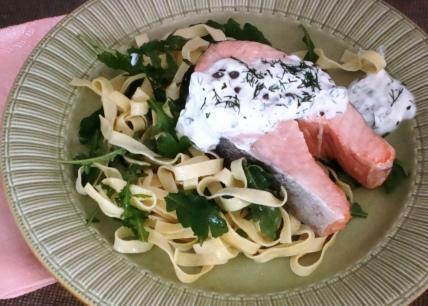 While salmon poaches, mix sour cream, lemon juice, dill and capers together. Remove salmon with a spatula to two dinner plates. Season with salt and pepper to taste. Spoon sauce on top. Makes 2 servings. Bring a large saucepan of 3 to 4 quarts of water to a boil and add pasta. Cook 2 to 3 minutes. Drain in a colander. Return saucepan to the stove and add arugula, olive oil and garlic. Toss 1 minute until arugula starts to wilt. Add drained fettuccine to the pan and toss. Add salt and pepper to taste. Makes 2 servings. 05/01/14 - Thursday's Topical Currents begins with a look at creativity through hands-on work. We’ll visit with woodworker Peter Korn, author of Why We Make Things and Why it Matters. Korn explores the nature and rewards of the creative practice. And more, Linda Gassenheimer speaks with Chef Richard Ingraham, the personal chef of Miami Heat star, Dwayne Wade. What keeps him going in their race for another championship? Fred Tasker offers his wine suggestions. Join us for Topical Currents . . . Thursday at 1pm. 04/24/14 - Syndicated food columnist Linda Gassenheimer, Special wine correspondent Fred Tasker and WLRN host Bonnie Berman interview Evan Benn, the new Miami Herald Food Editor. He talks about his plans for the food section and how readers can interact with it. 04/17/14- Syndicated food columnist Linda Gassenheimer, Special wine correspondent Fred Tasker and Bonnie Berman interview John Hillard co-owner of Hillard Bruce Winemakers; he believes that certified sustainable farming through Sustainable In Practice (SIP) is better than organic farming. Marty Mesh is the Executive Director of Florida Certified Organic Growers and Consumers, Inc. (Florida Organic Growers); he gives the organic side of farming.